Prakash means light or luminuousness, but Mahamati Prannath has connected it to the divine knowledge of Tartam- delivered by Lord Krishna himself to Shri Devchandra. 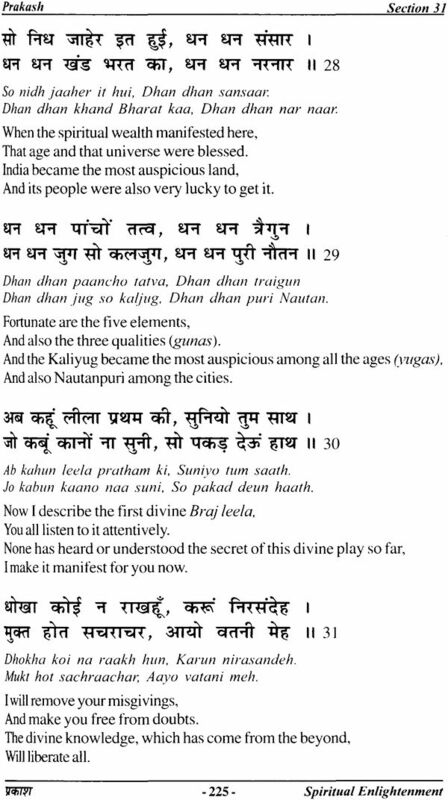 This maha mantra was originally in sixteen words and expanded later to six verses in this book Prakash by Mahamati Prannath. Mahamati was blessed by the Lord for the Gujarati version of this book in 1657-58 AD during his confinement in prison by the ruler of Jamnagar on some false pretext. Ras vani was first to appear followed by Prakash, wherein the followers of Mahamati, called Sundarsath, have been instructed on many subjects. 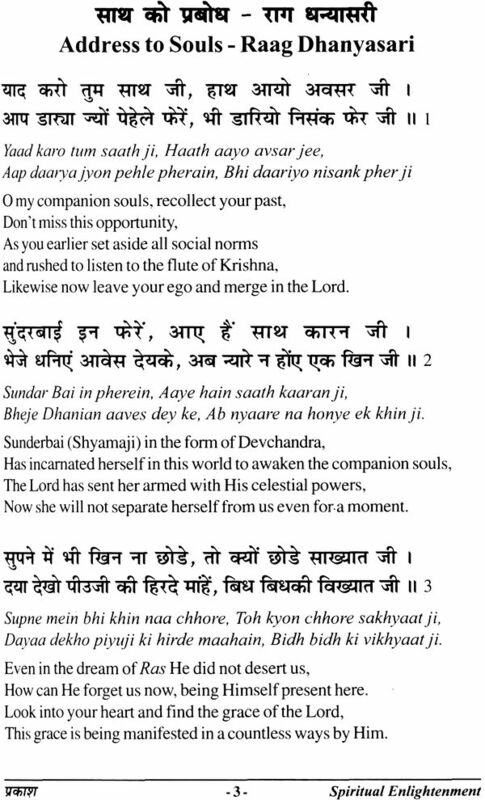 The verses on pangs of separation appeared when he was separated from Sadguru Devchandra. This subject is also dealt in details in Sindhi language. Mahamati has tried to count and enumerate the qualities of his master but even the largest known number (1 X 10 raised to the power 23) was inadequate for this purpose. While explaining these virtues, one after the other, Mahamati emphasizes the need to divert all such qualities and actions from this illusive world and be guided towards the Lord Supreme. He has spoken about attributes, virtues, aversions, arrogance, jealousy, anger, doubts, egotism, intellect etc. He shows the path of righteousness for every one in order to indulge in the activities useful from the viewpoint of religion and society. He says that wisdom without the true knowledge of Lord Krishna is ignorance and equivalent to being illiterate. He offers his services in sacrifice to the sacred land of Navtanpuri, where his master appeared and preached. In the section on spinning of cotton yarn he clearly brings out that while being engaged in the activities of this world it is possible to keep oneself connected to the Lord by means of devotion and worship. He has narrated the incidence of Devi Lakshmi and Lord Vishnu. On seeing her husband saying prayers she gets highly surprised. This ultimately leads to the realization of the true form of lord Krishna by Devi Lakshmi. In addition to all this Mahamati has preached that it is necessary to get awakened from the sleep of this false world and offer oneself completely to Him. 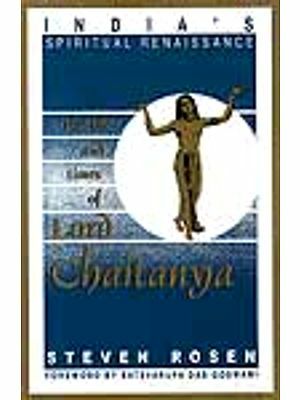 Mahamati has also dealt with topics like agony of separation, the distinction between milk and water, the essence of Bhagwat., apprehensions about His virtues and manifestation of this universe in this book. The book also gives a brief account of the life of Sadguru Devchandra and also the purpose of the drama of this world. In all there are 37 sections and 1064 verses in Prakash Gujarati. 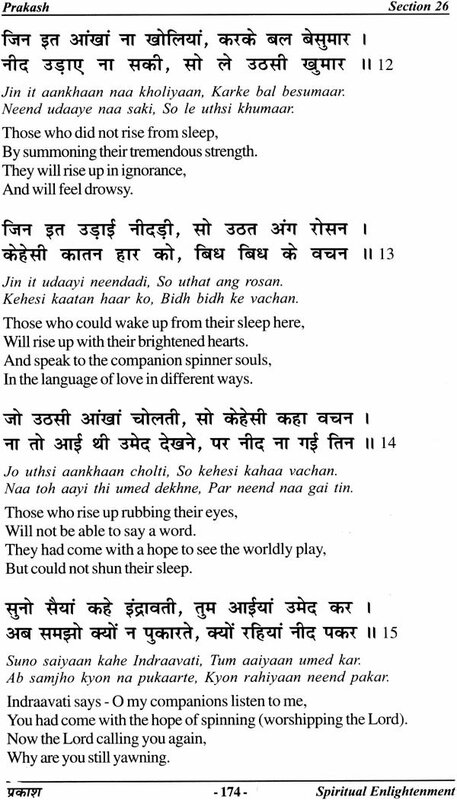 During his journey of religious promulgation from Delhi to Anup Shahar Mahamati brought out the Hindi version of Prakash. This comprises of37 sections and 1185 verses. Additional 121 verses were added in this conversion from Gujarati to Hindi language. 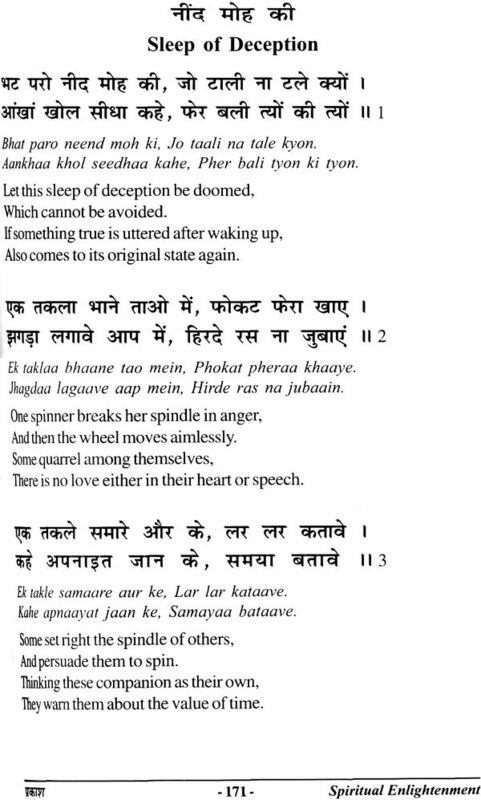 The first verse of Prakash begins with the words "kachhu in bidh kiyo Raas. ", which literally means that "the divine play of Ras was played in such a way." thereby indicating that Ras was not merely a night of joyful dances of the Lord with His consoles but has some deep spiritual message in it. Prakash is a consequence of this eternal play and acts as a force to inspire the soul to learn and imbibe its true meanings. The spiritual experiences of Ras cannot be explained in words. 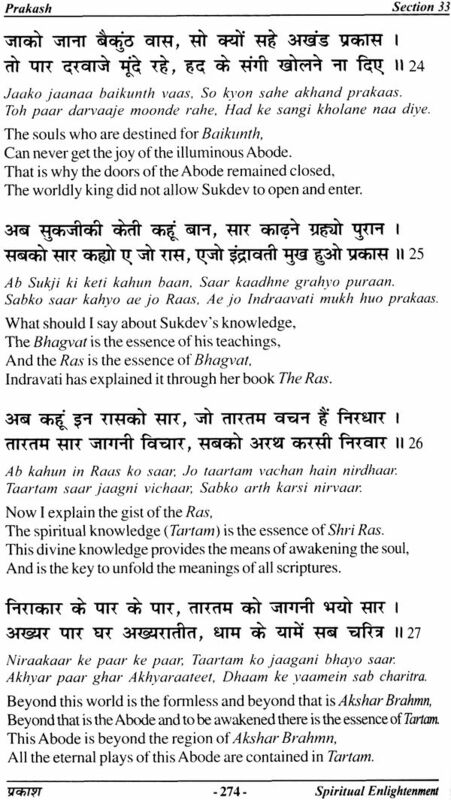 Complete understanding has to be developed to visualise the purpose of Ras, touching the soul and awakening it fully for attaining the union with the Lord Supreme. 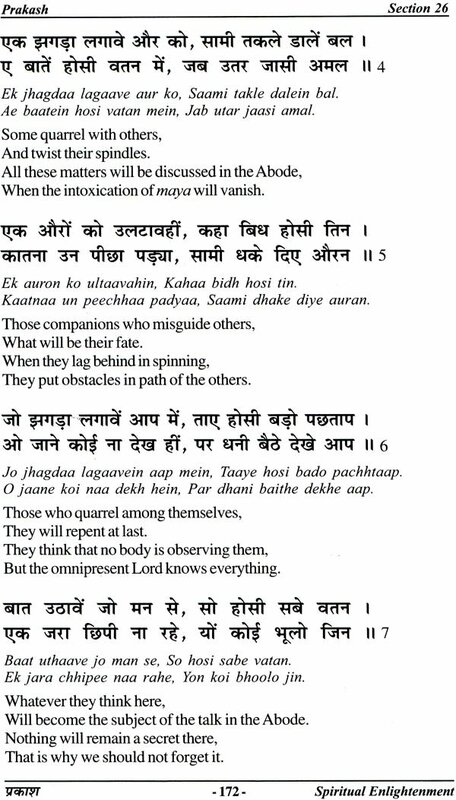 The illusory power of the lord, called Maya, attracts everyone towards the worldly pleasures. 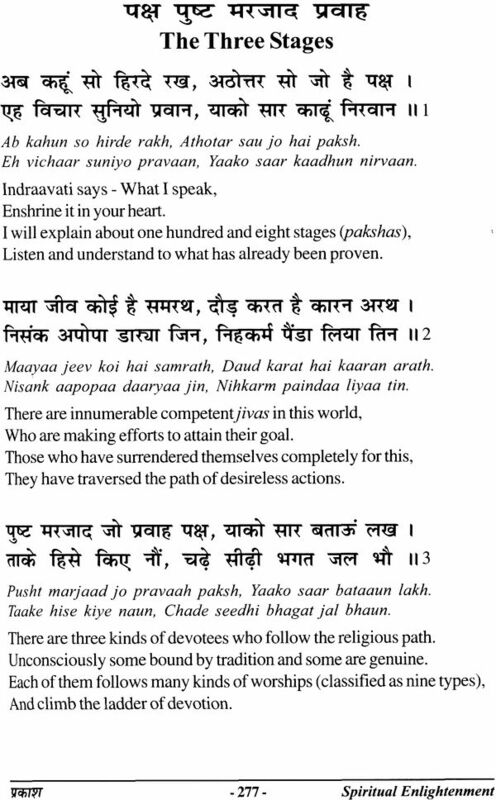 The verses of Prakash show us the way to keep away from Maya and illumines the path leading to the Abode of eternal bliss. 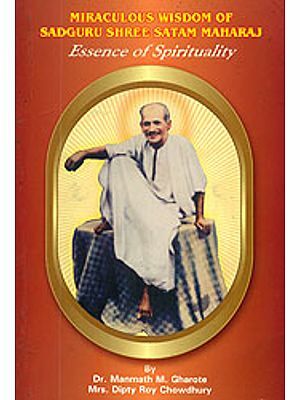 This book Prakash is considered equivalent to the sacred book Jaboor by Paighambar Daud in world literature, which also inspires the soul to find a way to unite with the master. 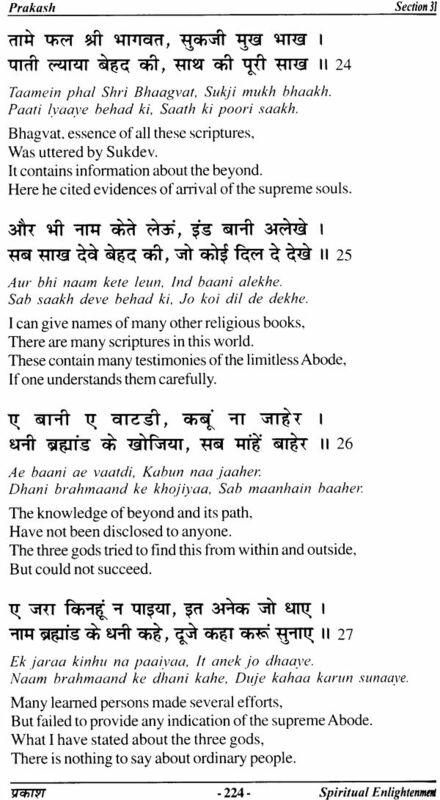 Mahamati has given all credits for this book Prakash to his master Sadguru Devchandra. 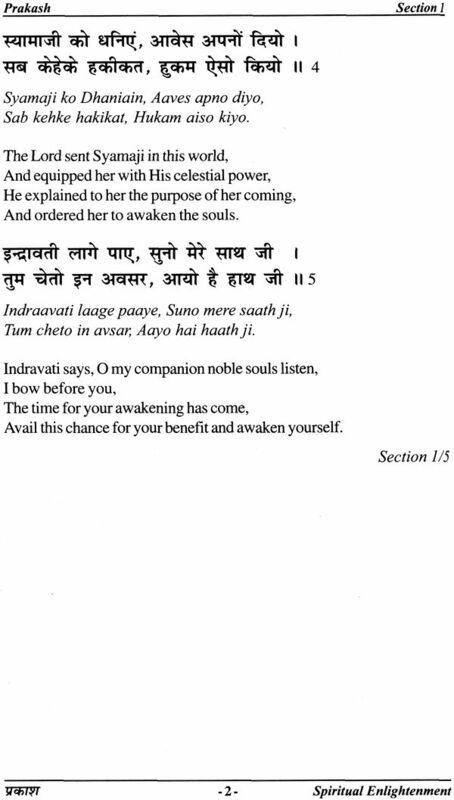 Lastly I would like to acknowledge gratefully the tireless efforts of Dr. R.K. Arora in translating Mahamati's vani in English language. Smt. Vimla Mehta had been the main source of inspiration in this entire activity. She along with Dr. Pran Gilotra have made significant contributions in bringing out this book. Literary the "Prakash" means light which removes darkness. Here it refers to that divine light which dispels delusion and ignorance and thus all the mysteries of Beyond are opened up, this being the acme of all the practitioners of spiritual science. In fact the Prakash is a profound essay on mysticism. Mysticism is a non-physical connectivity with the supreme cosmic intelligence whom we call the Lord. 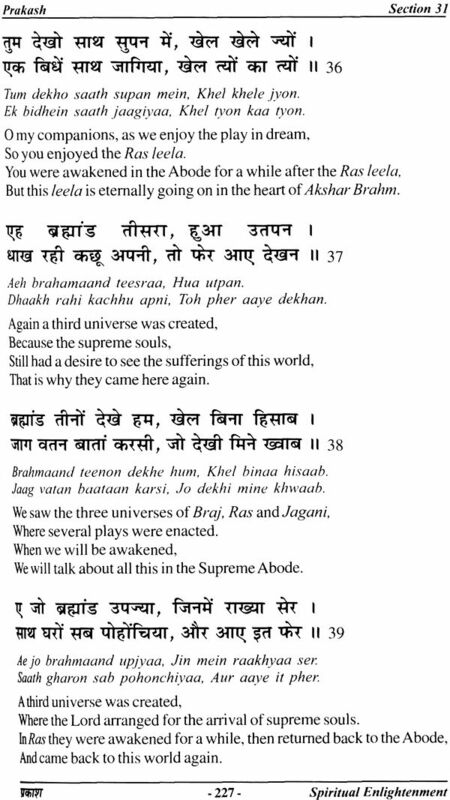 It is a call of the Beyond, a message from the Paramdham or the abode of the Supreme Lord. It is totally a free zone where the codified religion melts away and the pure religiosity remains. It is better called ontology, the science of self. In mysticism the spiritually exiled soul comes back to his home, the supreme mansion of the Supreme Being. 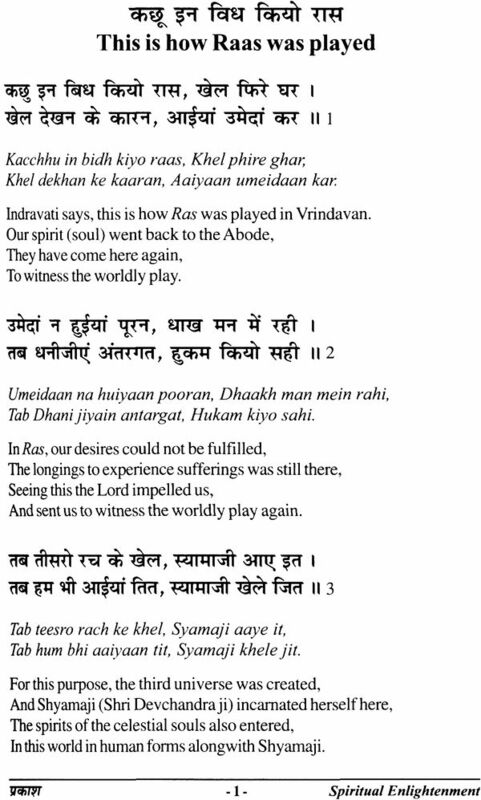 Return from the exile back to the original divine Abode is what the Prakash explains. 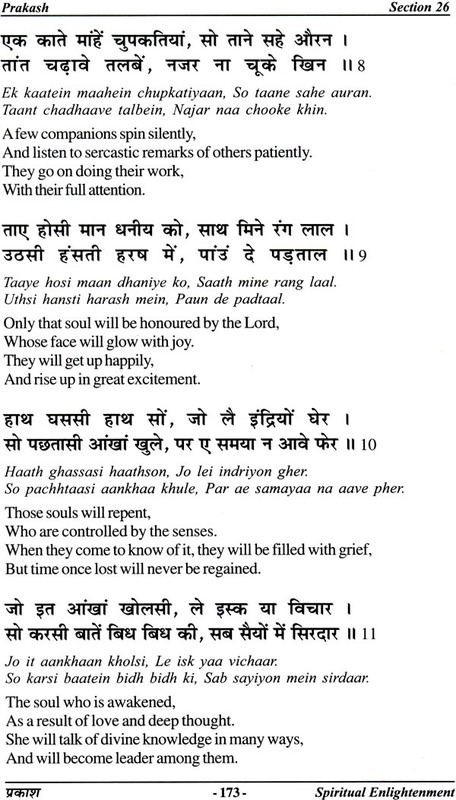 The return journey is the theme of the Prakash. The Ganges after much pollution has to go back to its perennial purity to Gangotri. The going back, according to Prannath, the mystic, is devotional mysticism or the loving devotion. The devotional hymns in the Prakash are unique in that they embody God steeped experiences of Mahamati Prannath, the founder of Pranami faith. Devotional mysticism or loving devotion takes on several modes according to the relationship envisaged by the devotee with the Lord. The most endearing type of mysticism is that of a husband and wife or a lover and beloved, which the Prakash highlights in very simple language and style. 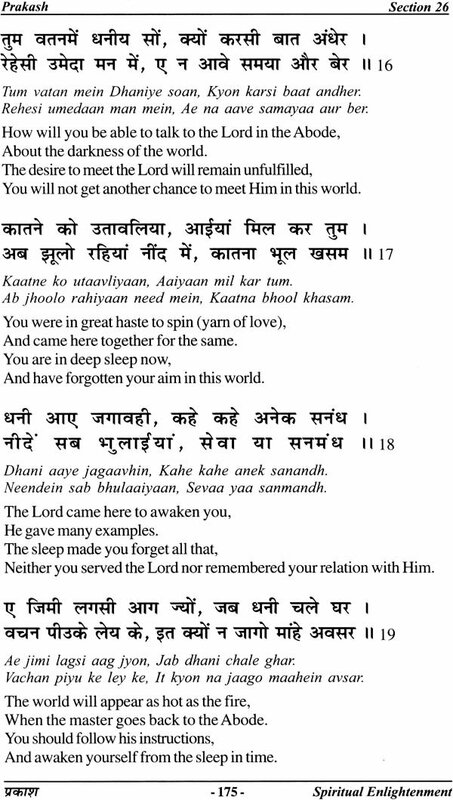 The soul, the citizen of the kingdom of God or in the language of Prannath, the Paramdham, asks the Lord to let them see the play of this world which He refused saying that, "You will forget Me after being in the world of delusion." On their insistence He gave permission and thus the souls became the citizens of this perishable world. On being refranchised from the Abode the Prakash instructs them to come back to their original Home. 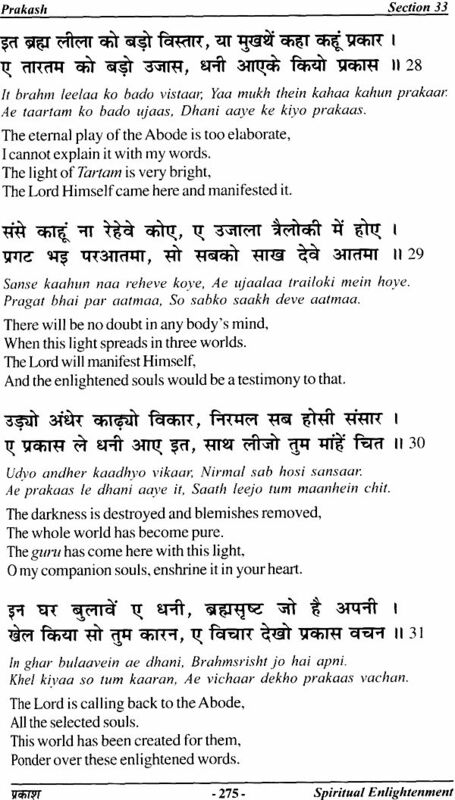 This is the mysticism of the Prakash. This mystic experience not only transcends intellectual thinking but also sensory perception. To give expression to this experience, in general, falls short of words and resorts to riddles, paradoxes, contradictions and mythological devices. 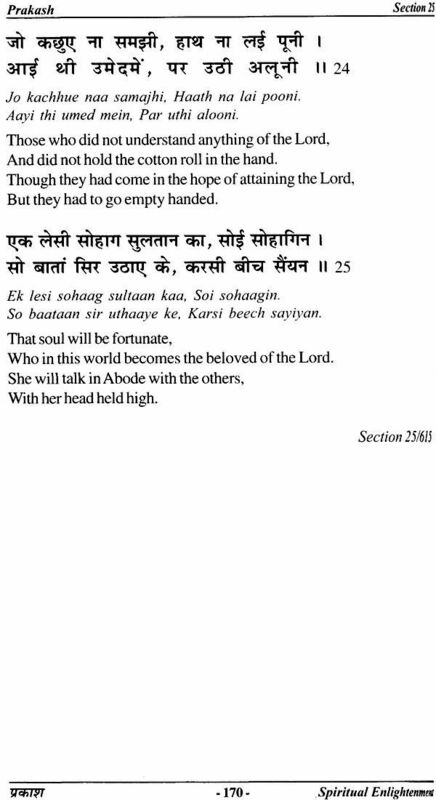 This is stated in several hymns of the Prakash. Here three aspects with regard to mysticism are the Lord, the master and the soul. These form the main theme of the book. Prannath explains with deep devotion and agony again and again to impress upon the devotees the majesty of the science of spirituality, to free the souls from the wandering, waywardness and worldly attachments. But the full activisation of the higher states of consciousness needs a conceptual frame work to incorporate the experience of spirituality. 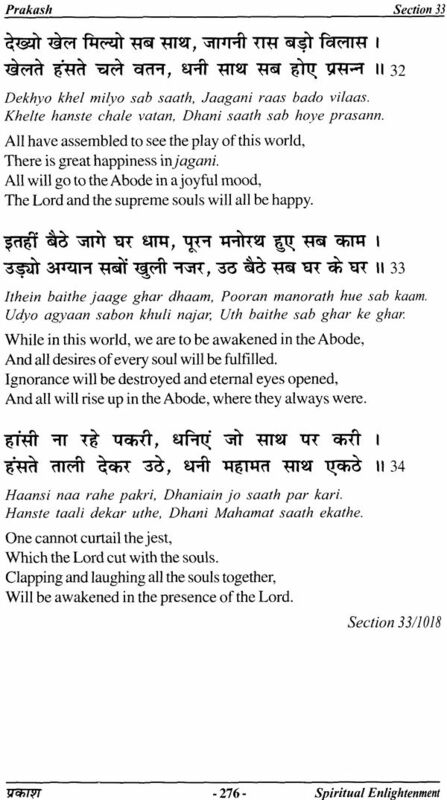 This is why the Abode is the zone where the Lord along with His marked souls stay in perpetual peace, joy and happiness. In the Prakash Lord's praise and His qualities find extensive mention. The simile of trees, ocean and the earth, stated in various religious books regarding the qualities of the Lord, find reference here too. But the counting from one to trillions of numbers regarding this aspect is found too inadequate to describe His qualities, by Prannath. 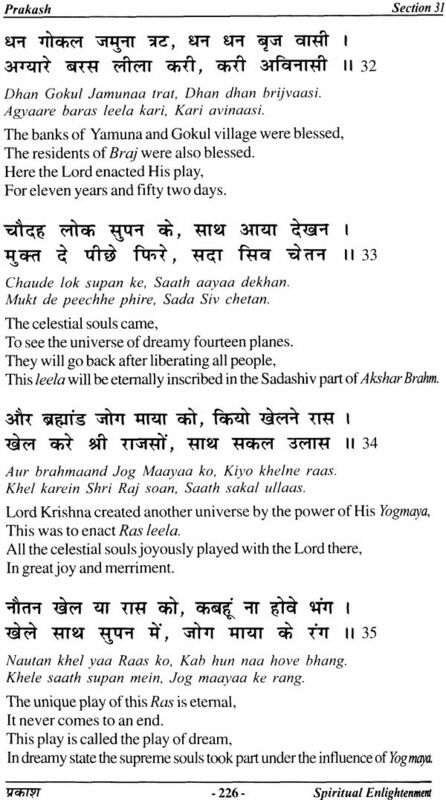 About the 'guru', the Prakash clearly says that the Lord sends His own great power, mercy and lope into this world to awaken those souls (Brahm srishtees) and bring them back home. But the living Master is a wondrous wave of God's being who comes to the world only to gather the souls from the show of life and take them back home. The master lifts the souls back into the ocean of light where they live in bliss and are always in the company of the Lord for ever and ever. The soul weeps and wails, cries and sobs in His absence and when this process reaches the utmost limit the soul rushes on until it arrives on the very door step of the Lord. In a flash of light the door opens and both, the lover and the beloved, face each other in great silence and joy. The opening of door is extensively mentioned here. The main thrust of the Prakash is the soul who lost her way in the morning and returns home in the evening. Lastly I would like to remember my departed wife, Dr. (Smt.) Anand Kumari Arora, who introduced me to the literature of Pranami faith and inspired me to undertake this very pious work of translating the spiritual messages of Mahamati Prannath in English language.